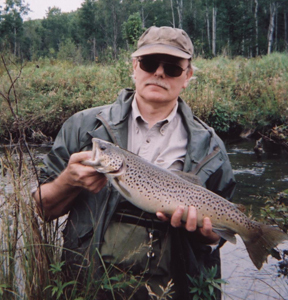 After a grueling stretch on the flooded Pine River Feral and I stopped at an upper stretch of the Baldwin we thought might be good for a couple fish. Main rivers were near flood stage so it made sense to hit smaller water. We were surprised to see a large group camping in what we thought was a secret spot which is funny now since the guys camping there said they camped there every spring. We probably wouldn’t have stopped to talk but they seemed friendly and waved so we pulled in, cracked a beer and joined them. We asked about fishing and no, they really weren’t fishing but once caught a trout down the hill from camp. “Are you morel mushroom hunting?” No, not out for mushrooms. Some of the guys had camouflage so we asked if they were turkey hunters. No, they weren’t hunting. 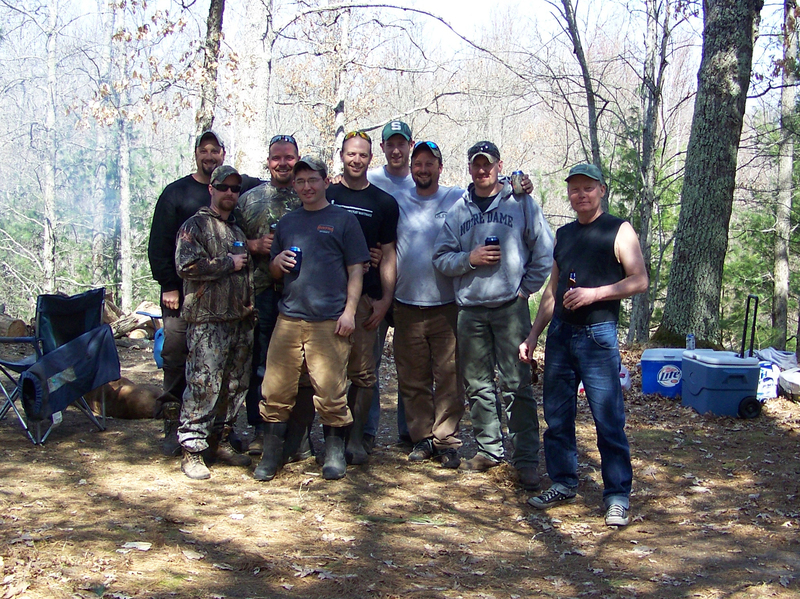 Bottom line: a bunch of guys that had to get outside and camp for a few days after a long winter. I could relate. They immediately warmed up to Feral who threw out a couple zingers, including one about one of the guy’s wives. I was thinking about an escape route but Feral’s sense of humor sent out the right message. We asked if they had a name for their group and sure enough, they call themselves the DFA Hunt Club which brought a new round of humor as it stands for “Death From Above” which Feral suggested may involve members falling out of trees, and the conversation degenerated from there to other possible words that DFA might stand for. They all had a sense of humor – which was great. I asked if I could take a picture and post it on Fichigan – and they were good on that. Feral’s on the right in the photo above so, unofficially, he is their newest “non-dues” paying member. I should mention theses guys are serious bow hunters that promote the sport including teaching the next gen of young hunters about sportsmanship and safety. They have a logo they put on t-shirts (see photo below) so if you run into one of them say hello and mention you saw them on a fichigan post.